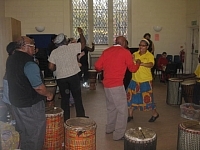 From our years of working in the community we have come to realise just how effective music and the arts can be in increasing people's sense of well-being. IROKO has developed workshops aimed at helping those who might feel a degree of social isolation. We work with a range of people including the elderly, people suffering from mental health problems and those wishing to reintegrate into mainstream society.